37signals, purveyors of Web-based collaboration services like Basecamp and Campfire, has released its second native application for iOS: Draft. What is Draft? 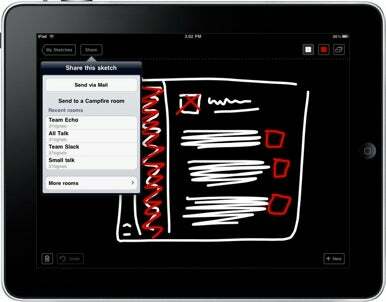 It’s a simple and, in 37signals’s words, “straightforward” sketching application for the iPad. Draft offers a dark, spartan interface and only two color choices for sketching: white and red. Add to that an eraser, a trash can, and an undo option—Photoshop, it is not. While Draft exhibits 37signals’s signature sparse feature set, it does sport integration with Campfire, the company’s Web-based chat room service. Draft can share your sketches via e-mail, but it can also send directly to any Campfire room that you have permission to access. If you’re using Safari to chat with your team in Campfire, you can switch to Draft, sketch an idea, and with a tap or two, drop your vision right into the chat room for discussion. As with many of 37signals’s other products, the target market for Draft is mainly folks such as Web designers, developers, project managers, and any businesses who sometimes need to let a visual mockup do the talking. Draft is available now in the App Store for $10, and requires iOS 3.2 or later.